This North Coast 500 starts and ends in Inverness and for 519 miles takes in places like John O'Groats and Cape Wrath, much of Sutherland - dubbed Europe's last wilderness - Wester Ross and Ullapool. It is absolutely magnificent and you want time, space and a comfortable vehicle to do it in. And it was on the last point that I got bit alarmed when hire companies - they are all flying into Inverness - started offering them cars like the Opel Zafira or a number of other so-called seven-seaters. Just imagining six strapping millennials, their luggage and camping equipment getting into one of these vehicles was horrible enough, but knowing that some of them would be robbed of really enjoying some of the finest views in the world by being jammed in the back, seemed to negate the whole purpose of the trip. It would have been good if I could have recommended one of the really excellent seven-seaters that I have tested over the last year, especially the award-winning Skoda Kodiaq and absolutely outstanding Peugeot 5008. But, while the two rear seats can be used for adults, they aren't ideal for long trips. They soon become quite claustrophobic with windows that don't open and luggage space being massively restricted. There is a massive equipment list with some of the best safety devices I have tested. You don't have to leave the entry level for most of it, although the 2WD Executive Plus model at €43,995 is the one to go for. Of course, Hyundai has that five-year warranty, and, as we reported last week, very high satisfaction and reliability records. 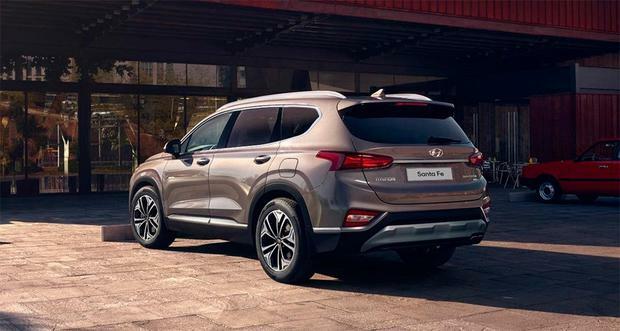 I was driving the very top-of-the-range 4WD model and at that level the Santa Fe is getting pretty expensive at €57,495. It's a very competent, if not exciting, drive, probably a bit thirsty, but I'd happily follow the lads around Scotland in it. It would be effortless driving.